In her continuous efforts to engage with the community she serves, Mangaung Metro Executive Mayor, Cllr. 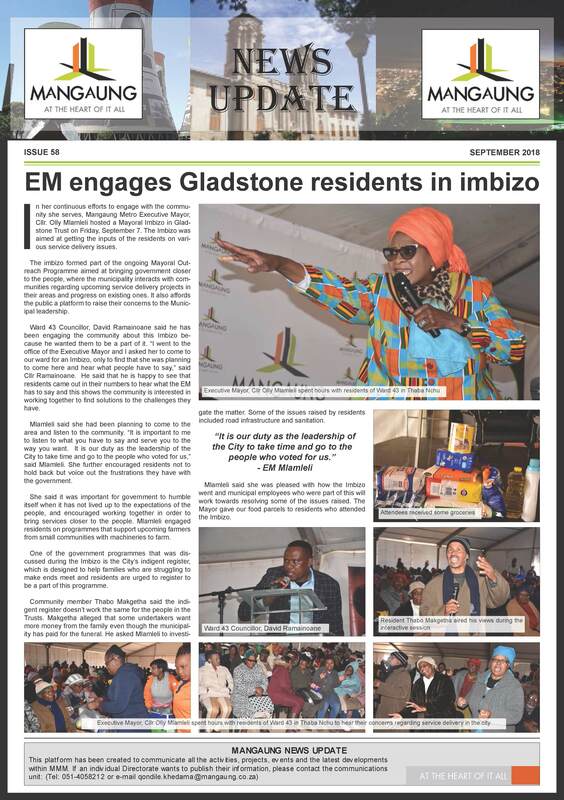 Olly Mlamleli hosted a Mayoral Imbizo in Gladstone Trust on Friday, September 7. The Imbizo was aimed at getting the inputs of the residents on various service delivery issues. The imbizo formed part of the ongoing Mayoral Outreach Programme aimed at bringing government closer to the people, where the municipality interacts with communities regarding upcoming service delivery projects in their areas and progress on existing ones. It also affordsbthe public a platform to raise their concerns to the Municipal leadership.